How to make a pyramid doorstop? •	Cotton fabric and 12cm x 1cm matching ribbon; Fabric are currently on sale on Laurashley.com with some of the fabric being reduced by more than 50%. •	And finally some general sewing supplies, a funnel and some sand. For the templates, you have to draw then cut a 15.5cm square piece of card for the base. On another piece of card, draw a 15.5cm line (triangle base line). Mark centre of line, then draw a 15.5cm line straight up from this mark (triangle peak). Draw 2 diagonal lines connecting peak to base line ends (triangle sides). Cut out the triangle. Using a hot, dry iron, press interfacing onto wrong side of fabric. With interfacing face up and using templates, trace, then cut one fabric square (base) and four fabric triangles (pyramid sides) adding a 1cm seam allowance. Important: don’t forget to follow the direction of the fabric pattern. With right sides facing and using a small, straight stitch, machine stitch 2 fabric triangles together along 1 of the long sides. Press seam open. Repeat with the remaining 2 fabric triangles. With raw edges even and right sides facing, lay stitched triangle pairs on top of each other. 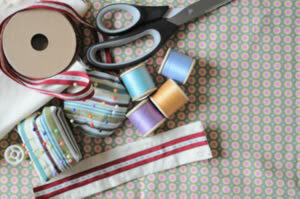 Folding ribbon in half, sandwich and pin ribbon ends in centre of peaks between the 2 layers of fabric. Leaving a small opening, pin and then machine stitch final long sides together to create a pyramid. Press seams open. Clip across seam allowance at peak. With right sides facing, pin and then machine stitch square base to bottom of pyramid, 1 side at a time, pivoting at corners. Clip across corners. Turn right side out. Insert the funnel into the side opening. Fill pyramid with sand. Slip-stitch opening closed.